The words driving direction, forwards and reverse are very blurred and therefore sometimes lead to confusion. They are only precise if it is clear whether they refer to a train or to the locomotive only. For this the easiest way of understanding is to consider a freight train with many cars for example, pulled by an electric engine with the two cabs of the locomotive marked with 1 and 2. The modeler is aware that such a locomotive moves forwards when its cab 1 is at the front end seen in driving direction (with three-rail engines often the position of the slider on this side is a clear direction indicator). If such a train, however, is seen driving in the real world from afar, it will always be clear that the train is moving forwards although it may be unknown which cab is at the front end. This is exactly what the direction of travel of block side routes refers to: It's about the direction of movement of the entire train (where the train can be a single locomotive, too). The consideration here is a long freight train will never go reverse but always forwards with the locomotive pulling at the front end. Therefore, the direction of movement with block side routes is strictly forwards: If a route is defined from A to B, then this is "forwards", the opposite direction ("reverse"), from B to A, is excluded! For trains travelling from B to A necessarily a second route from B to A has to be created. For this route from B to A again is "forwards". The directions of railway lines are sometimes addressed by the terms "upwards" and "downwards" (up / down). In the present case from A to B, for example, would by upwards and from B to A downwards. If the long freight train again is seen in the real world from a distance, except that the train is moving forward, it will also be clearly visible whether the train goes up or down (i.e., for example, if it is on its way from A-town to B-village, or vice versa). With block side routes the moving direction of the train (up / down) is set by the block enter side: Depending on at which side the train enters a block it either moves up or down through the block and possibly the following route. The arrow shown in the block symbol is indicating the direction of movement of the train by pointing to the exit side of the block. The orientation of the locomotive, i.e. whether cab 1 or 2 is in front, is represented by the placing in Rocrail: On model railroad layouts it is important in which orientation the locomotive was placed on the tracks, e.g., by hand. 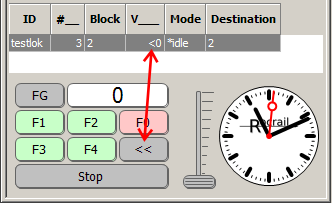 Technically speaking, the placing indicates in which way a speed command is to be interpreted: If the train is moving forwards, and this direction is the only one possible with block side routes, generally a forwards command will be sent. When the locomotive of the above example was placed with cab 1 pointing in the direction of travel this will lead to the desired result. However, if the locomotive was placed the other way around it will push the train backwards with this setting. In order to inform Rocrail that the locomotive is orientated the other way around the placing has to be changed. The engine then gets a reverse command so the train moves forwards. For push-pull trains, represented by commuter trains in Rocrail, the placing has an additional impact: A change of the placing (swap) is needed, so the train can travel in both directions. In order to understand the meaning of the swapped placing regarding commuter trains one could consider, for example, a push-pull train with the locomotive at one end and a control car at the other end. If an engineer is on the locomotive driving the train (forwards as the train is behind him) to a terminal station where the train has to stop, then the engineer needs to change (swap) his place in order to drive the train in opposite direction: He has to leave the locomotive and to go all the way to the other end of the train and take his seat on the control car. Now he can take the train back the other way, of course in forwards direction because the train is yet again behind him. Commuter block = A block allowed for commuter trains. 1) 0 = idle; for a normal train auto mode is stopped, see Rocrail Properties. An action "loc swap" (1000ms timer) can be assigned to any block (with wait) and (under conditions, such as "counter = 3") cause a change in direction. The direction can be changed manually by selecting Swap placing from the context menu of the loco or of the block the loco currently occupies. Swapping the placing also changes the block enter side, but not vice versa. If the direction is set to 'reverse' by means of the direction button of a throttle (s. Direction Indicator below) the direction will be set to 'forwards' automatically and the placing will be swapped. However, in this case the block enter side will remain unchanged. The direction indicator (arrow head) in the velocity column of the loco corresponds to the direction of movement selected from a throttle. On blockside routes the direction of movement, as discussed above, must not be "reverse" at any time in automatic mode. For this reason the direction of movement is automatically switched back to forwards in case it was set to 'reverse' once the loco is started in automatic mode. The placing will be swapped at the same time. Direction of movement 'forwards' Direction of movement 'reverse'. The front side of the loco (side with the chimney) is pointing towards block 3. 2 is shown in column Block. The meaning is the loco is in block 2 and the block enter side is +. 0 is shown in column V (velocity). This is, Rocrail will send commands for 'forwards' direction to the loco. With the settings shown in the above picture the loco will drive from block 2 to block 3. The front side of the loco is pointing towards block 1. -2 is shown in column Block. The meaning is the loco is in block 2 and the block enter side is -. 0 is shown in column V. This is, Rocrail will send commands for 'forwards' direction to the loco. With the settings shown in the above picture the loco will drive from block 2 to block 1. Note: 'Reverse' in this case refers to the running direction of the loco! The direction of movement nevertheless is forwards. The latter is indicated by the arrow head in the velocity column pointing to the right while the running direction of the loco is indicated by the negative sign: -0>. 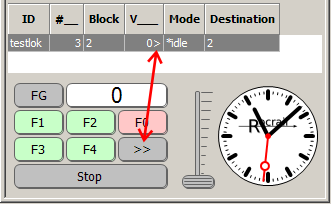 -0 is shown in column V. This is, Rocrail will send commands for 'reverse' direction to the loco. The chimney of the steamer is pointing towards block 3.